Oregano essential oil, also known as oil of oregano, is steam-distilled from the leaves of the oregano plant. The earthy, aromatic liquid contains the highly concentrated properties of the oregano herb. Oil of oregano is used not to flavor Italian cooking, but rather as an antifungal, antibacterial, antiparasitic agent against everything from salmonella on the kitchen counter to lice on the scalp. Oil of oregano may prove effective for treating fungal infections, but always check with your doctor before using it. Fungal infections are unsightly and often cause discomfort, but they rarely threaten your health in a serious way. Athlete's foot appears not only between the toes, but also sometimes on other areas of the feet. A separate kind of infection, also fungal in nature, causes toenail or fingernail discoloration, brittleness and separation from the nail bed. The infamous jock itch afflicts the groin area or the tops of the thighs. The type of fungal infection known as candida presents itself as diaper rash or thrush in babies, and yeast infections in teen and adult women. Ringworm is a type of skin rash that is a fungal infection. Apart from your limbs and torso, this type of fungus may also appear on the scalp or the nails. Aromatherapist Jeanne Rose notes that experienced healers prepare internal medicines with oil of oregano for flu, bacterial infections and heavy menstruation. More frequently, oil of oregano is applied externally, always in a highly diluted form to avoid irritating the skin. Rose recommends its topical use for a range of fungal infections, as well as for head lice, scabies and even cellulite, and as an inhalant for bronchitis and other respiratory illnesses. According to Drugs.com, oregano oil contains 71 percent of the antiseptic compounds known as phenols, including thymol and carvacrol. According to New York University Langone Medical Center, oil of oregano's use experienced a spike in the 1990s, when advocates for a theory about candida proposed oregano oil as a curative. The theory about yeast infections posits that candida not only affects people through external itching and irritation, but exists internally as well. Internal yeast infections cause allergic but previously unexplained reactions such as headaches and fatigue, according to the theory. Yeast infections are sometimes proposed as the primary cause of other illnesses, ranging from asthma to arthritis, notes the medical center. Because oil of oregano was already a known antifungal, products containing the essential oil proliferated for internal use. But NYU Langone Medical Center warns that no reputable research currently exists to show that oil of oregano, or other known natural antifungals, can treat these illnesses. 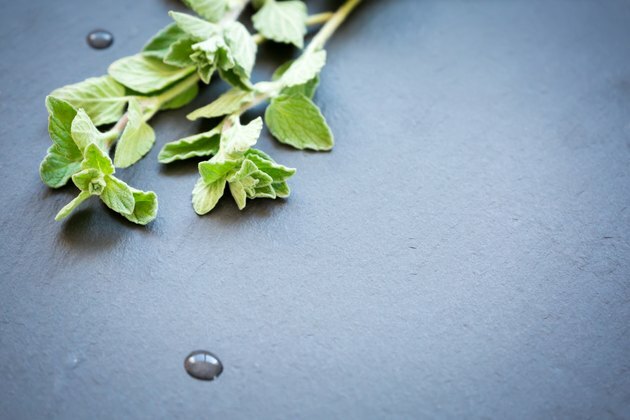 Because oregano oil is linked to promoting menstruation, pregnant women should avoid using oil of oregano in any form, notes aromatherapy author Roberta Wilson. To treat external fungal infections, Wilson suggests using a formula of 1 drop oil of oregano to 1 ounce of carrier oil such as olive oil or sweet almond oil. Apply the formula to nails, scalp, skin or wherever the fungal infection appears. Because the oil is so potent, ask your doctor before using oil of oregano on the skin, especially near the genital area for such problems as jock itch, yeast infections or diaper rash.